You have the determination. You have the strength. You have the resources. Now all you need are the instructions. ⇦Link to purchase the eBook format! Have you resigned yourself to a life of food anxiety, body hatred, and diet obsession? Have you given up all hope that recovery is possible? It’s understandable you would. Most recovery-oriented resources out there offer disjointed soundbites of feel-good platitudes. You understand the various messages floating around in therapy, but you just want to know what to do when. And that’s exactly what this journey offers. 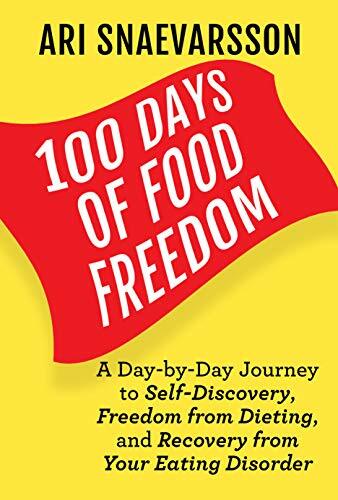 100 Days of Food Freedom is a guided journey through self-directed recovery from your eating disorder. For the next 100 days, you will be completing various tasks, exposures, habits, and “Adventures.” This will culminate in a state we call Food Freedom. You do not even need to have an eating disorder diagnosis to benefit. Anyone suffering from disordered eating who is motivated enough to change can and will recover using the tools throughout this journey. What will you gain from embarking on this journey? Whether you suffer from restrictive eating, binge eating, purging, body image issues, over-exercising, or any disordered behaviors that obstruct you from living a life of freedom, this book is for you. I’m a PN-certified nutrition coach at True Fitness & Nutrition in McLean, VA, and I work one-on-one with clients to help them achieve their nutrition goals. I specialize in working with anyone dealing with disordered eating or an eating disorder. I also have experience working at a residential eating disorder treatment center, in which capacity I’ve seen clients with severely disordered eating patterns make full recoveries. I have my Bachelor’s in Health Sciences and have worked as a research assistant. My dietetic internship was at this same residential ED treatment center. I’ve been featured on the Sigma Nutrition podcast with Danny Lennon to discuss my research on refeeding severely anorexic adolescents. And I’ve led a Precision Nutrition webinar on how to identify and work with clients with disordered eating. Finally, and most importantly, I’ve recovered from my own eating disorder. With my history in competitive bodybuilding and the subsequent post-contest binge eating patterns, I’ve had to go through the incredibly depressing restrict-binge cycle for years. When I was finally able to achieve full recovery, something I never thought I could have done, I realized there are so many others out there who were in my position (or worse) who have the strength and fortitude to beat their EDs, yet don’t have the resources. That’s why I’ve created this 100-day journey for you. The approaches in this book come from my research-based knowledge of eating disorder refeeding protocols and therapeutic intervention; the anecdotal observations from my clients and what it took to bring them to a place of recovery; and my own experiential knowledge of how I had to go about rerouting my disordered eating behaviors. Click here for your free PDF! ⬅Buy, share, or preview the eBook here! The instructions throughout these 100 days are crystal clear. There is plenty of cited scientific evidence throughout the book, upon which the concepts you’ll be using were created. There is a specific order to the themed weeks and daily tasks that ensures you are always capable of the tasks at hand yet will be consistently challenged. All you need is yourself to be able to follow through with this journey. You do not need to pay for expensive therapy services, a meal plan, or anything else. Each day, read the appropriate day’s section, do the task(s) assigned, and watch as you discover who you are and achieve Food Freedom. Check out the 100 Days of Food Freedom official Spotify playlist below! Purchase the 100 Days of Food Freedom eBook here! Don’t think the answer is yet another diet. Commit to the 100 days as they are outlined and give yourself the gift of Food Freedom.